Selfie nowadays is very common, especially when someone possessed a Smartphone that works as well as having your own digital camera. Smartphones does too many things now and one of them is taking your photo. Even more selfie to do. A simple and common way of including yourself, to a picture, you'd like to take. But it would even better when you have the accessories that would hold on with your smartphone/camera and take a better view of the background you'd like to include. I have the opportunity to review a nice Selfie Stick by AGS. The item arrived in the mail in a great condition. Though the packaging is too big for the product, the important thing is we look forward to get a brand new merchandise. 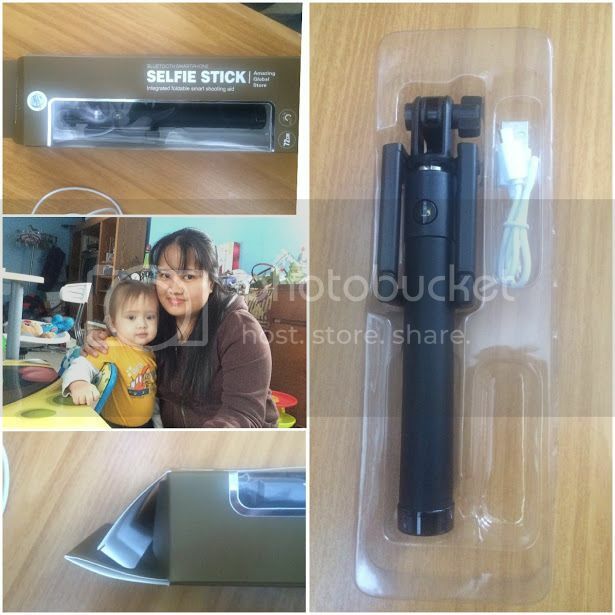 · AGS brings you the latest Selfie Stick with Bluetooth shutter button for Smartphones. Small in size and easy to use, fully adjustable to the desired angle & length. · It's compatible with all Smartphones whether IOS or Android including iPhone 6S/ 6S /6 Plus/5S. Nexus 5x/Nexus 6P. Samsung Galaxy Note 5/S6 Edge S6/S5/S4. · The soft cushions in the clamp can well prevent your phone from scratch and slide during using. Amazon Buyers Trust our AGS Brand to be Quality Products. You are Backed by our Life Time Warranty Too! The product is very handy and stylish. Unlike the once I have, the old one I have this selfie stick has a feature that doles the gadget holder. Even more space and can be carry in no hassle. The installation and syncing with my phone is very simple and quick. Something I always look forward to whenever I acquire a new Bluetooth device. The pairing for each device is not complicated. So, this one works great and the pairing is also quick. The color black and the design as I mentioned is very cool. Lightweight too. It is long enough which could reach. Small in size and easy to use, fully adjustable to the desired angle & length. For the price of List Price: $39.99, now Price is $19.99, it is on Sale now for$14.99 that would save you $25.00 (63%). That is a great deal for you to acquire your own awesome selfie stick. I would say, this product does good to me and I will recommend this product to those seek for a great deal as well as a nice selfie stick to have. I bought a selfie stick a while ago and used it at first but not much these days. I do keep my tripod with me at all times because you never know when you are gonna just need it.